Age is just a number so long as you have the mind body and soul to chase a dream you can still achieve it. Ruth flowers embodied that message perhaps better than anyone else. Ruth under her stage name of Mammy Rock was a British grandmother who became one of the most celebrated and in-demand DJs in the entire world. She lost her husband when she was already in retirement age and for a time she seemed content to spend her remaining years living in a coastal region of Portugal with great weather and beach views. Then looking for something to do with her spare time she got involved in planning her grandson's 21st birthday party. She found the process brought her a great deal of joy and decided to turn up to the event in a nightclub a rude bouncer who suggested that she was too old to enter the venue. "I went to the party late. The doormen said 'Oh, I don't think you want to go in there, madam. And I said 'I rather think I do because it's my grandson's birthday'. So, I went in of course," she explained. This was the final push she needed to set about proving that anything is possible if you put your mind to it. Ruth was going to show that bouncer that not only did she belong in a nightclub she could be the DJ if she wanted to Ruth had no DJing experience at all and her only previous experience of performing was providing lectures on the works of classical author Charles Dickens. Despite that she started taking lessons and how to mix and as her skills developed her quirky tastes made her unique the press became interested in her story and her first ever booking was in front of a celebrity audience at Cannes Film Festival in 2009 at the age of 68. Just four years later aged 72 she was routinely flown around the world to perform in every iconic clubbing city where crowds couldn't get enough of her. Mamy Rock was a sensation nobody cared about her age. They just loved her talent. Life is a learning experience for as long as we want it to be. Ruth Flowers aka "Mamy Rock", was a British disc jockey ... 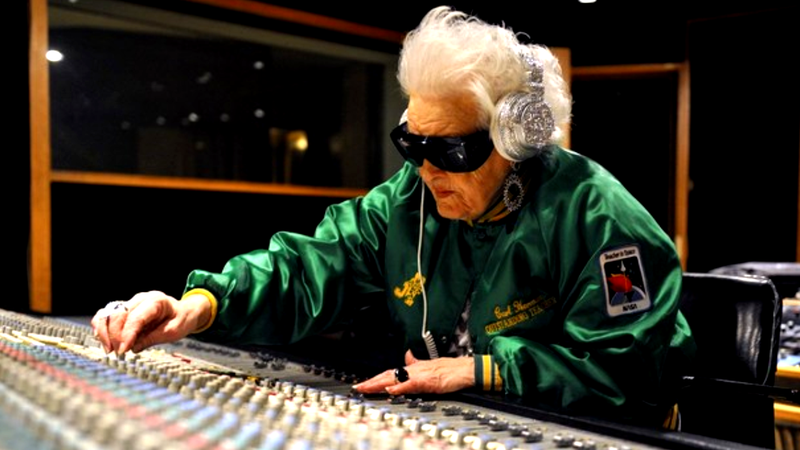 Oldest Female DJ - world record holder.